with other signs and symptoms. Itching skin during pregnancy may be due to a number of causes that were present prior to conception. At other times, those conditions that appear after conception may have been developing or were bound to develop, irrespective of the pregnancy. In both these instances, pregnancy was not the cause or precipitating factor and these itchy skin conditions were non-specific. Refer to Causes of Itchy Skin (1). However, itchy skin in pregnancy may be a result of some underlying condition or cause that has been exacerbated due to the pregnant state. Alternatively, pregnancy was the trigger for the onset of a condition which the woman was predisposed to but had not as yet presented due to the lack of precipitating factors. Hormonal, immunological or unknown factors relating to pregnancy may serve as a trigger or aggravating factor for pre-existing or chronic skin diseases. Refer to Itchy Skin Rashes (2). Of these type of conditions, allergic conditions resulting in itchy skin are the most common. The increasing estrogen levels are known to exacerbate allergy-related conditions and may be also be noticed by females using hormone contraceptives or even hormone replacement therapy (HRT). The use of antihistamines to treat the itch are often of concern due to the debate surrounding the teratogenic properties of these drugs. Certain antihistamines like chlorphenamine have a long safety record in pregnancy and can be used for palliating the itch although this should only be done after consulting a doctor or gynecologist. Itching within the first trimester of pregnancy is common and is usually not a cause for concern if there is no visible skin rash or concomitant signs and symptoms. It mas spontaneously resolve after a few weeks or months. Anxiety may play a role in this type of itching (psychogenic) as it is more frequently noted in first time mothers. However if the itching is persisting, getting worse, affecting sleep or other activities, then it should be investigated. There are certain causes of pruritus in pregnancy that may only occur or are more likely to occur in the pregnant state. The cause may pose a threat to the fetus and should therefore be investigated. Also known as polymorphic eruption of pregnancy (PEP) or previously as toxemic rash of pregnancy. Tends to occur in the third trimester and sometimes immediately after pregnancy. More commonly affects a woman in her first pregnancy but may recur in subsequent pregnancies. Itching may be very severe and affect sleep and other activities. May appear as small, red and raised patches (papules) or spots and less frequently as tiny red ‘water pimples’ (vesicles). Usually occurs in the areas where stretch marks (striae distensae) is most prominent – abdomen, thighs and buttocks. Less frequently it may be found on the arms. Also referred to as eczema of pregnancy but should not be confused with atopic dermatitis. The latter may have been pre-existing and related to allergies earlier in life which may have also presented as as asthma or allergic rhinitis (allergic triad : eczema, asthma, hay fever). 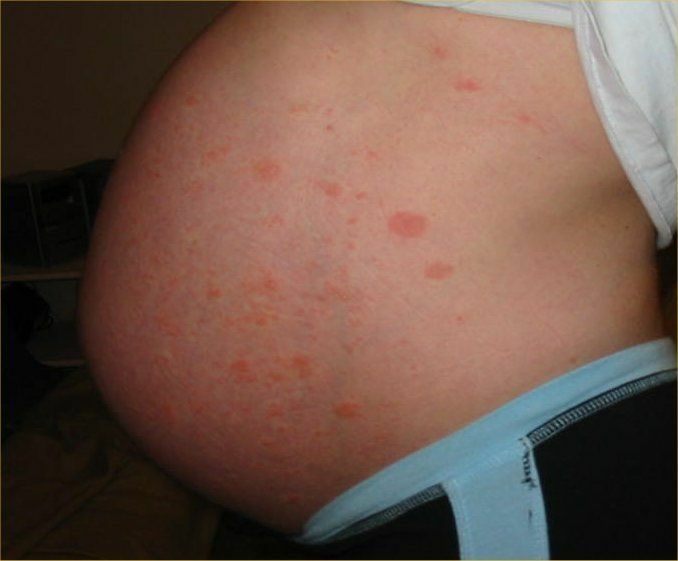 Atopic dermatitis can recur or aggravate during pregnancy. Tends to occur in the second trimester of pregnancy. May start off as tiny red spots and progresses to patches of dry, rough, worn out/cracking skin (excoriated papules) similar to eczema. Closely resembles PUPPP. Usually occurs on the chest, upper parts of the arms and legs. Previously known as herpes gestationis due to its appearance but it is not caused by the herpes virus. Tends to occur in the third trimester of pregnancy but may initially appear in the latter part of the second trimester. This is a pregnancy-associated autoimmune disease. Progresses into large blisters (bullae) surrounded by rough, cracking skin (excoriated papules). Inflammation of the hair follicles which is often mistaken for acne. In pregnancy, folliculitis is very rarely due to an infection. Tends to occur in the third trimester of pregnancy. There is usually no infection. Intensity of itch varies – can be very severe or a mild itch. Small red spots (no fluid) or pustular pimples (aseptic pus-filled pustules). Affects the chest, back, shoulders, upper part of arms and abdomen. Antihistamines for symptomatic relief of itching. Antibiotics may be necessary if there is an infection (rare). May occur in the third trimester of pregnancy. Poses a varying degree of risk to the fetus and an early delivery may have to be considered. Abnormal liver function tests (LFT) is an indication of obstetric cholestasis. Occurs when bile (bile salts) enter the bloodstream due to the diminished flow of bile out of the liver. No discernible skin rash in most cases, except for excoriation due to scratching. Mild jaundice may be present (sometimes, not always). Yellow discoloration of the skin, sclera (eye). Pale stool and dark urine.